About four years ago, Lamar Advertising teamed up with Eskew+Dumez+Ripple, a New Orleans architecture and design firm, to renovate the Baton Rouge headquarters. 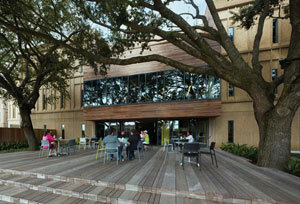 One part of the plan was establishing a more inviting cafeteria area with indoor and outdoor seating. The new space includes a food prep area and a unique set of bleachers that connects the first and second floor and can be used for seating during company events. Image: Lamar Advertising Company's outdoor patio. As well as being a café space, the area has video projection capabilities so the staff can hold meetings or watch LSU football games. The interior dining area seats about 100, while the outdoor patio seats about 30. The architecture firm also took a cue from the oak trees outside that offer a shady space for dining, incorporating a wood finish on the indoor bleachers as well. Steve Dumez of Eskew+Dumez+Ripple says the firm designed the space with Lamar's previous cafeteria in mind but also added some new ideas, such as Lamar's "one coffee pot" management philosophy. The original article appeared on 225 Magazine's Dine blog. 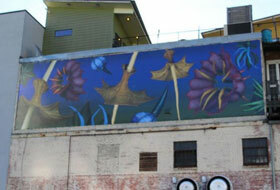 Lamar Advertising Company teams up with the BR Walls Project to create an ‘outdoor art gallery’ in downtown Baton Rouge.